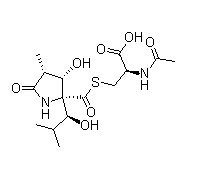 Marizomib, also known as ML 858, NPI-0052 and Salinosporamide A, is a potent and selective 20S proteasome inhibitor from natural origin. Lactacystin is a specific and an irreversible inhibitor of proteasome with IC50 value of 4.8 μM. 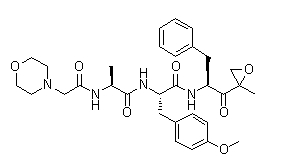 MG132 is a potent 20S proteasome inhibitor (IC50 = 0.22 nM). Exhibits cytostatic and cytotoxic effects in tumor cells in vitro. PI-1840 is a potent and selective inhibitor for chymotrypsin-like (CT-L) (IC50 value = 27 ± 0.14 nM) over trypsin-like and peptidylglutamyl peptide hydrolyzing (IC50 values >100 μM) activities of the proteasome. MLN2238 rapidly hydrolyzes to MLN2238, which is a selective, orally bioavailable, second-generation proteasome inhibitor, inhibits the chymotrypsin-like proteolytic (β5) site of the 20S proteasome with an IC50 value of 3.4 nM (Ki of 0.93 nM), and also inhibits the caspase-like (β1) and trypsin-like (β2) proteolytic sites with IC50 of 31 and 3500 nM, respectively. Cysteine Protease inhibitor is a inhibitor of cysteine protease. Gabexate Mesylate is a Factor X inhibitor. 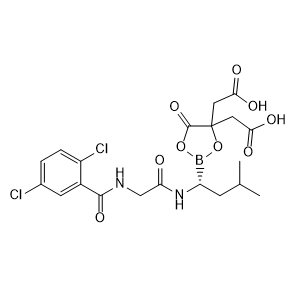 PD 150606 is a selective, cell-permeable non-peptide calpain inhibitor.